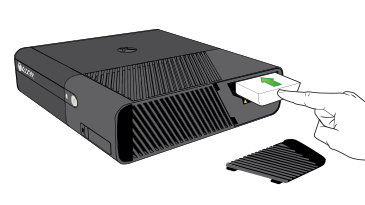 Learn how to add or remove an Xbox 360 Hard Drive on your Xbox 360 console. The Xbox 360 E 250 gigabyte (GB) console has an internal hard drive, which can be removed and replaced. The Xbox 360 E 4 GB console has internal flash memory, which is not removable. An internal hard drive for the Xbox 360 E 4 gigabyte (GB) console can be purchased separately. The Xbox 360 S 250 gigabyte (GB) console has an internal hard drive, which can be removed and replaced. The Xbox 360 S 4 GB console has internal flash memory, which is not removable. The internal hard drive can be purchased separately. 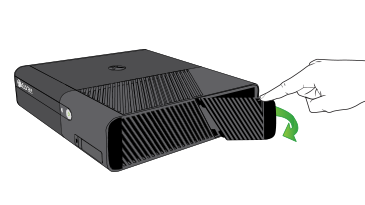 Note When you handle your Xbox 360 hard drive, avoid touching the hard disk drive bay contacts or the hard disk drive connector with your fingers or metal objects. Position the back of the hard drive against the back of the hard drive bay. Note If your console did not previously have a hard drive, you will need to remove the hard drive bay cover before attaching a hard drive. Push the front end of the hard drive down until it clicks in place. Make sure Hard Drive appears in the list of Storage Devices. If it does not, try removing and reattaching the hard drive to the console. Would you like to contact Support regarding the "Add or remove an Xbox 360 Hard Drive" issue you were reading about or a different issue?